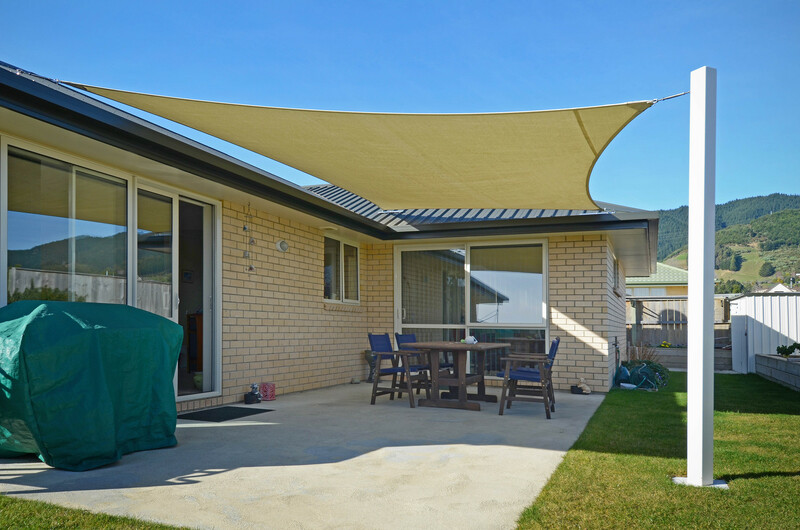 Shade sails (sun shades) are very popular forms of shade. 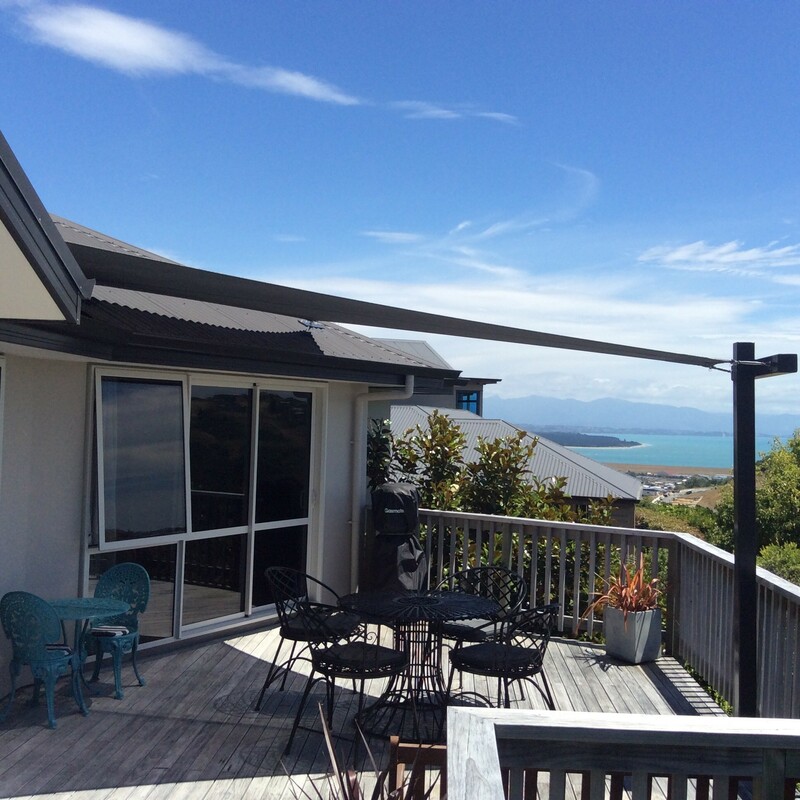 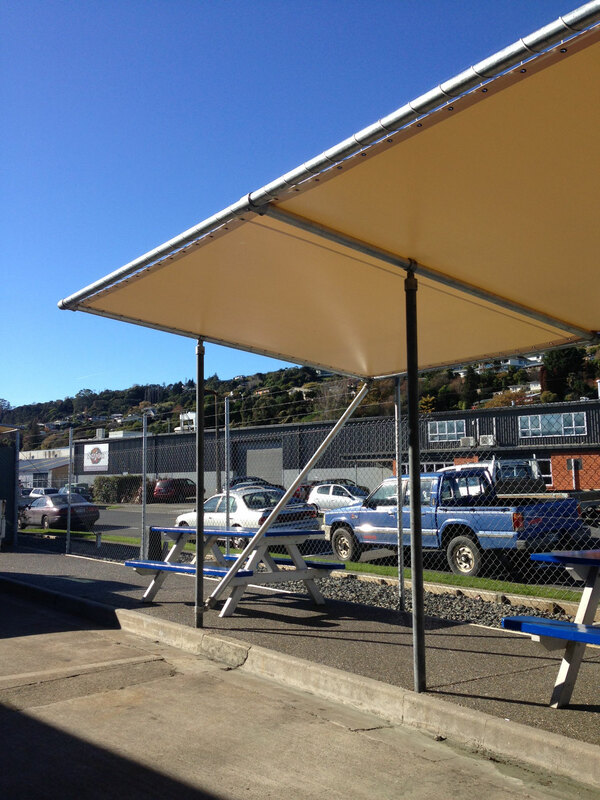 Made in our workshop in Nelson, they are custom fitted and designed for individual needs. 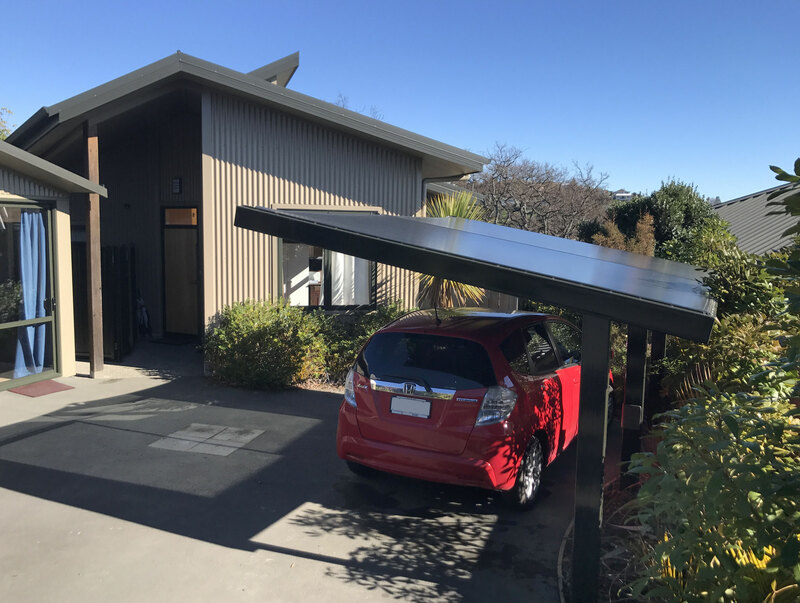 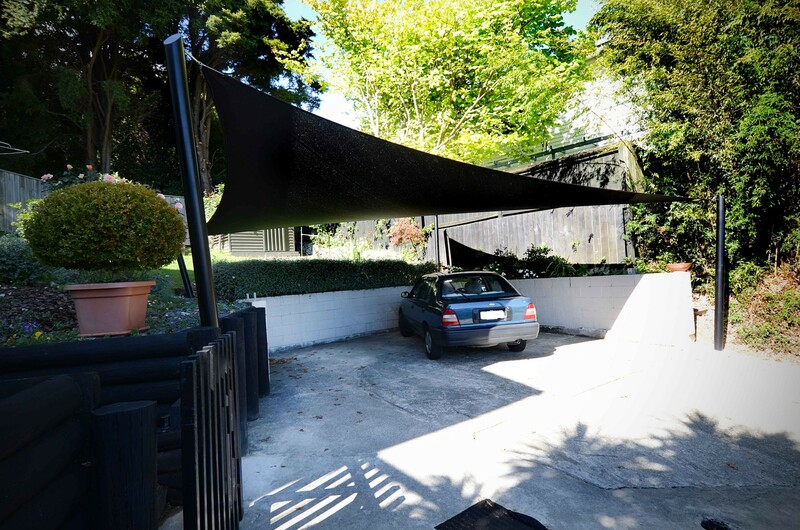 "Thanks for organising the the installation of the sun shade yesterday, it looks great and the installers for very helpful and polite. 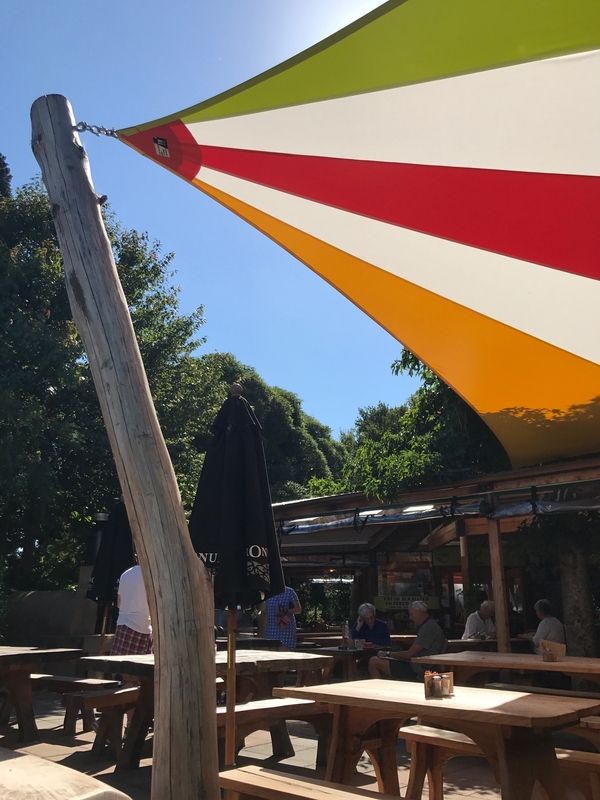 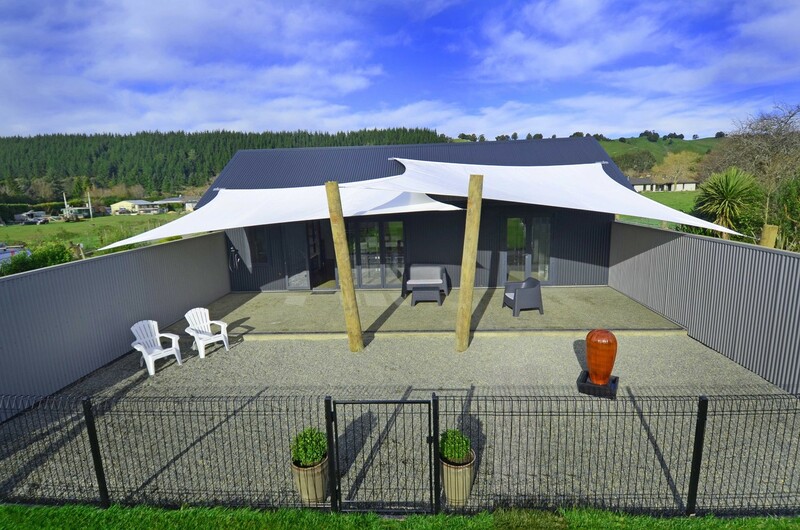 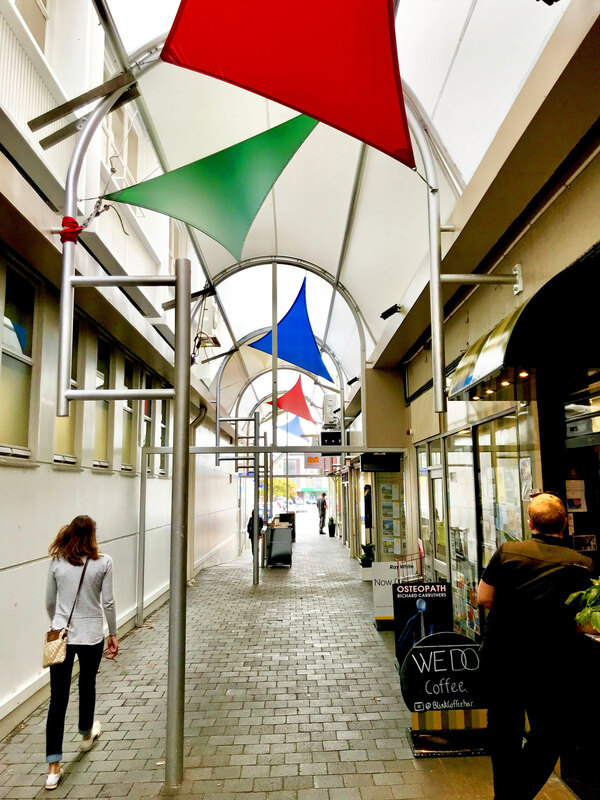 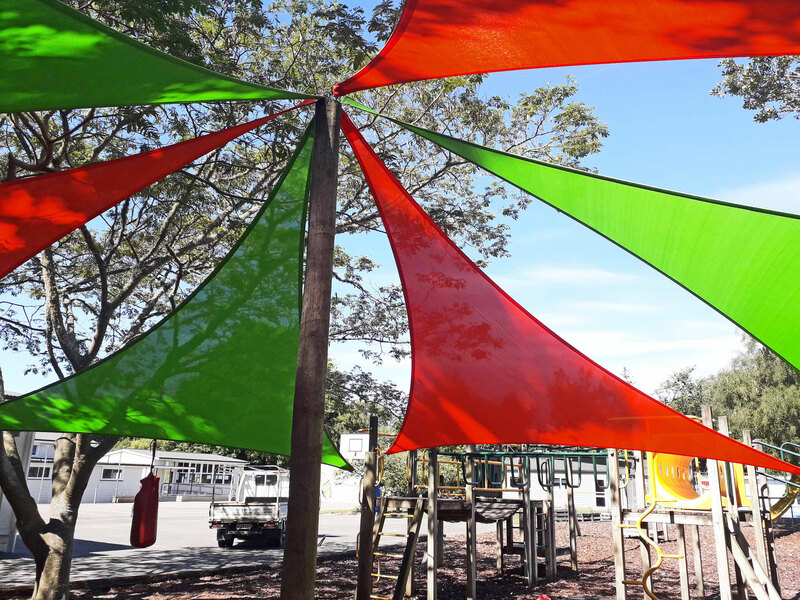 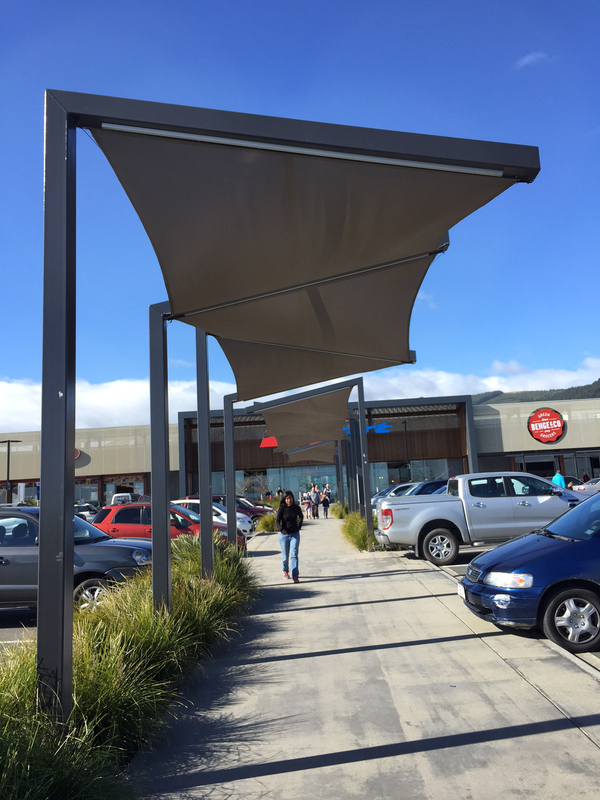 Well done.Regards Brian"
Specifically designed and engineered for your particular site and aesthetic requirements, our shade sails will provide you with many years of use, enjoyment and protection from both rain and the sun's harmful UV rays. 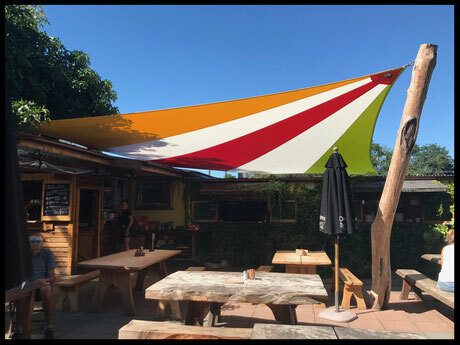 Extending your area outside, you can relax in the knowledge that our shade sails will provide you with many years of enjoyment whilst keeping you cool and safe from the sun's harmful UV rays. 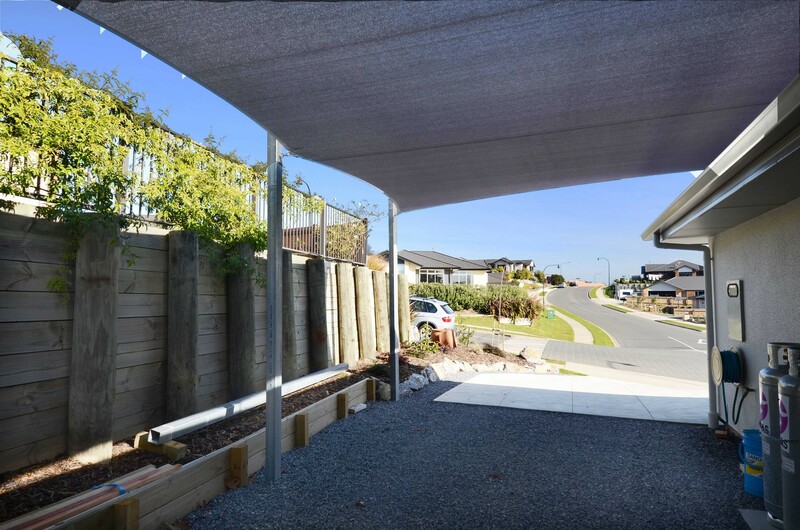 Unlike fixed structures, they will shade you in summer and, when winter comes, they can be easily removed to allow the sun in. 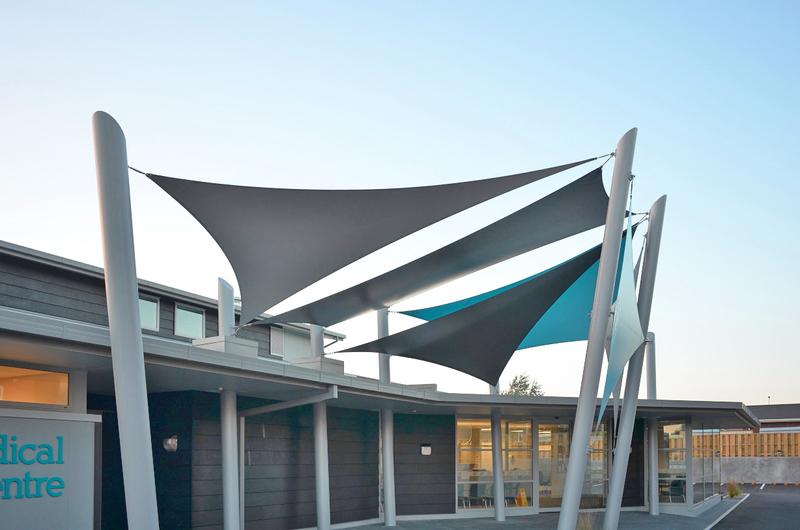 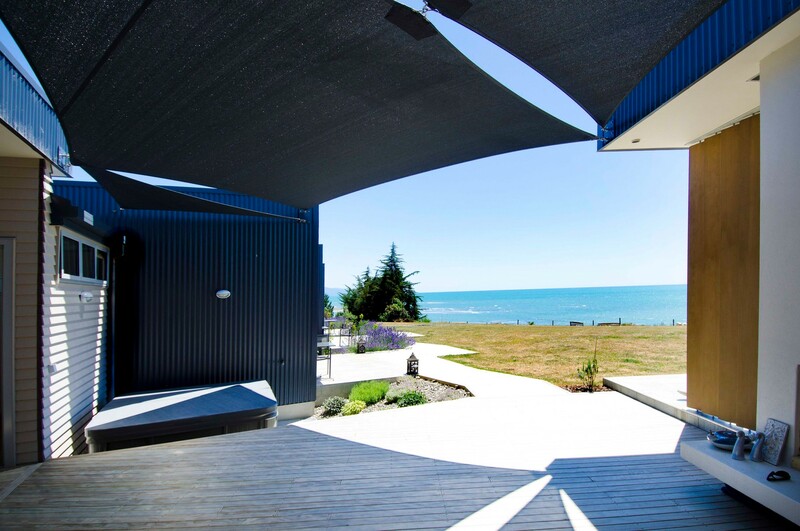 Shade sails are tensioned fabric membranes that, whilst functional, can be angled, overlapped, joined, shaped and twisted into a virtually limitless variety of soaring, sleek forms. 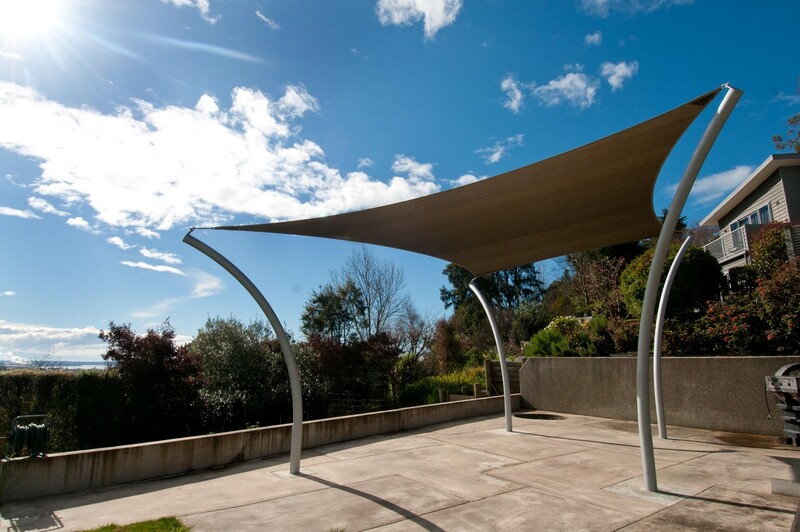 Shade sails (sun shades) are made in fabrics that are manufactured especially for the purpose. 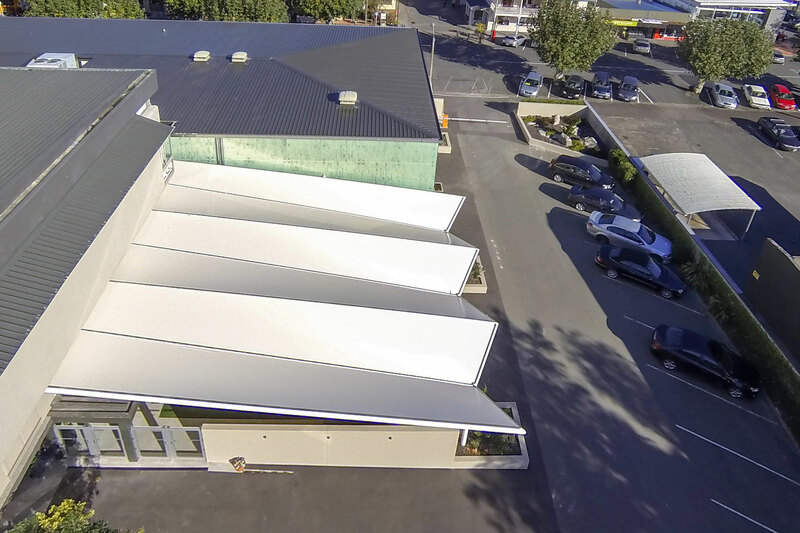 The fabrics we recommend have a limited manufacturers warranty for 10 years against any deterioration in the fabric structure. 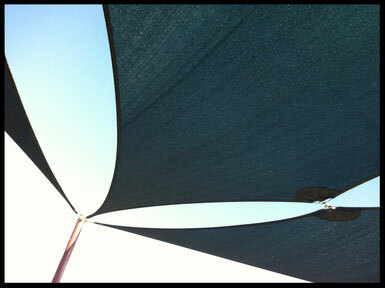 The fabric is a polyethylene and, being loose woven, it is porous which helps to avoid water pooling in the sail. 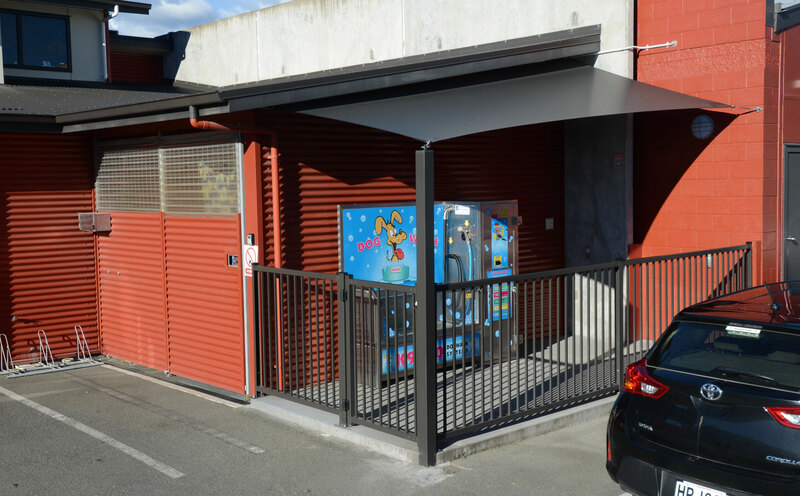 They are tensioned on stainless steel wire with turnbuckles and shackles attaching them to the support structure. 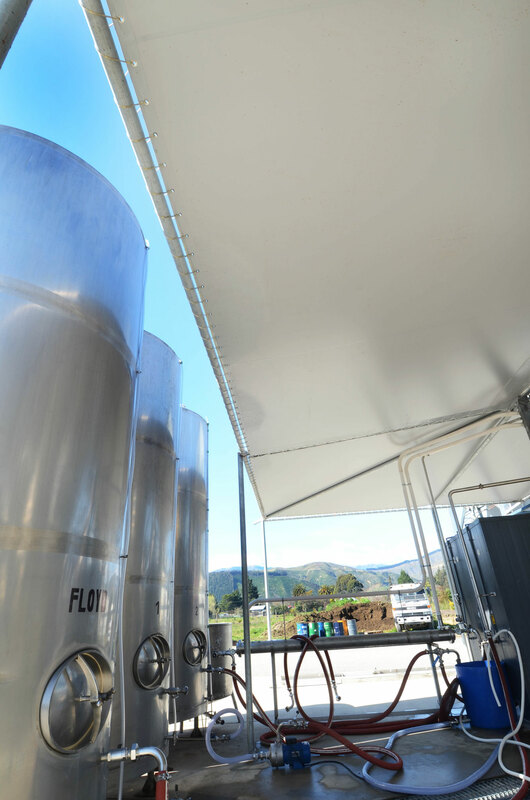 They are tensioned very tight to ensure they do not flap and the water runs off them. 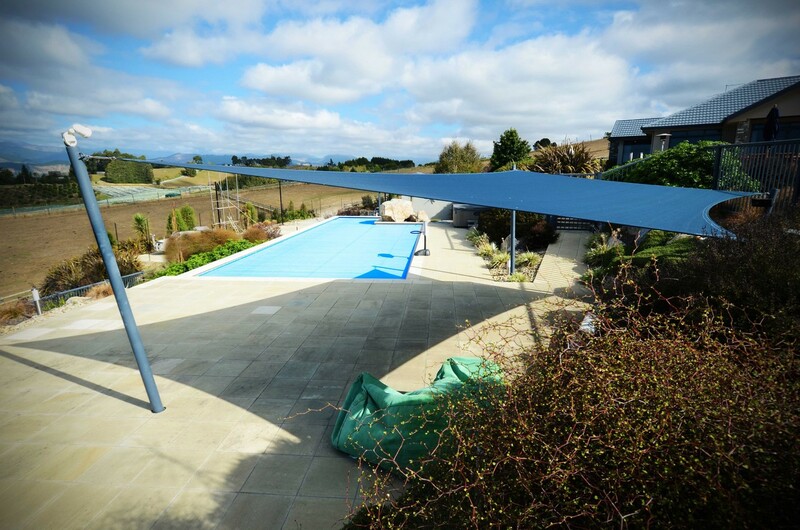 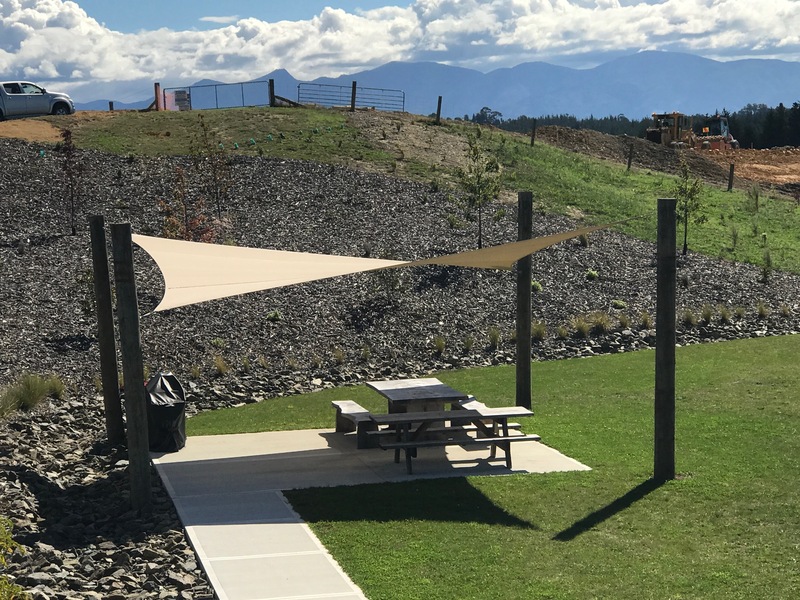 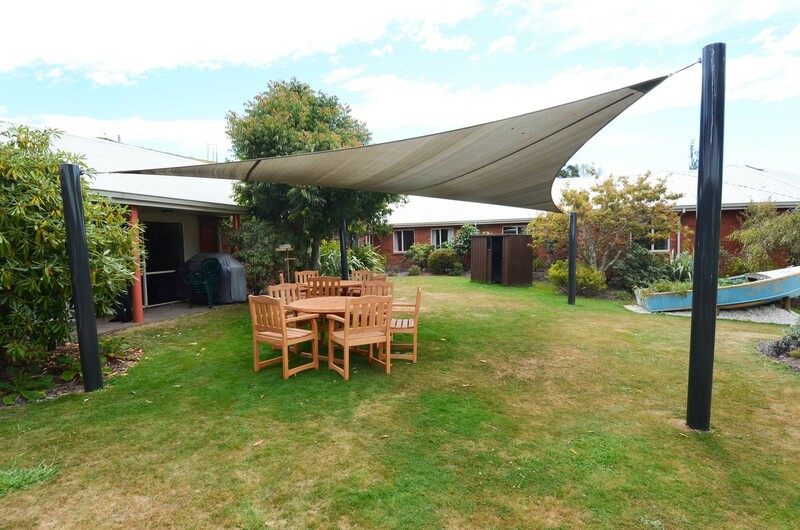 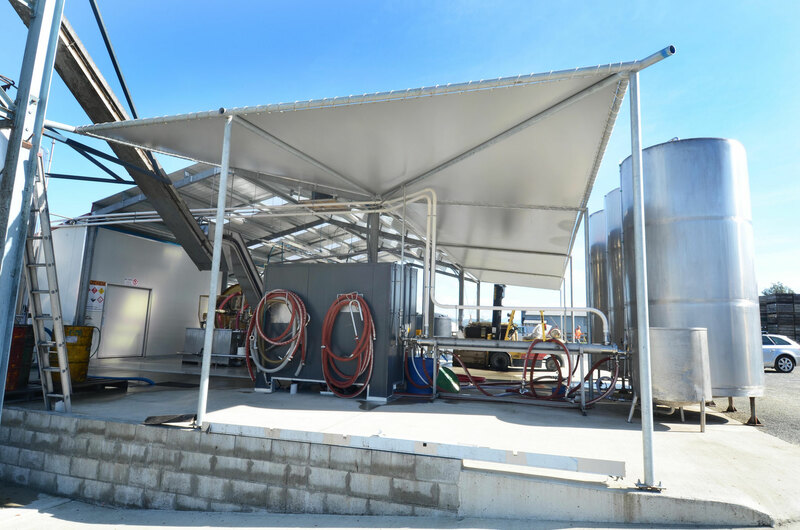 Shade sails need to be sloped for efficient water run off - which direction they slope is dependent on where the wind and sun are and also where you want the water to run to. 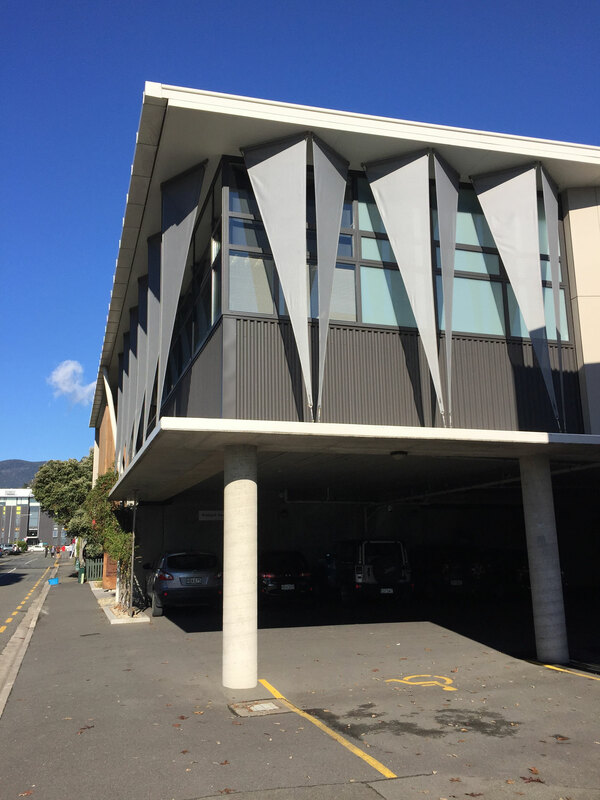 They are best when attached to posts however roof and wall brackets are possible where there is sufficient strength in your building. 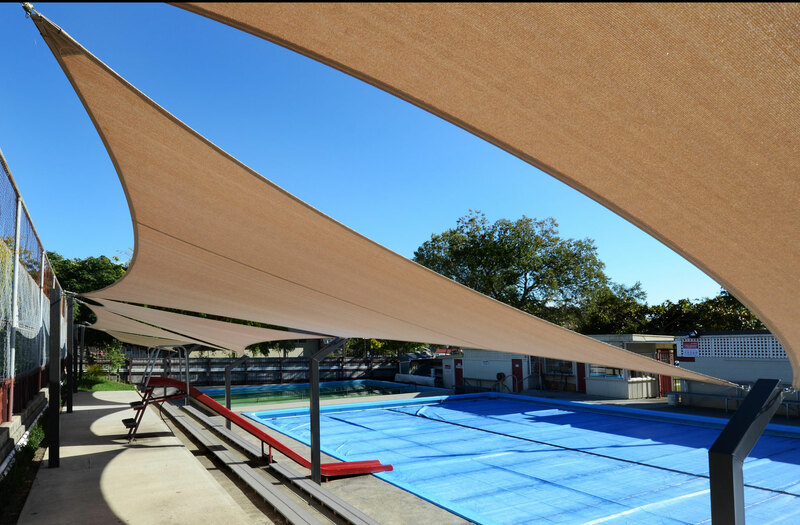 Shade cloth is a HDPE fabric and, being loose woven, is porous which helps to avoid water pooling in the sail. 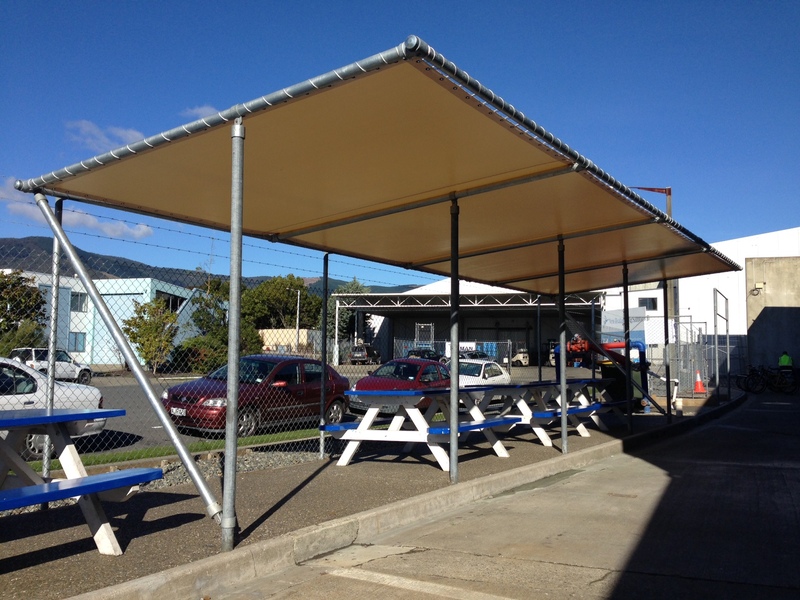 The shade is recorded at up to 95% under the sail and the UV filtering effect is recorded at up to 97% - shade and UV protection is different depending on colour choice. 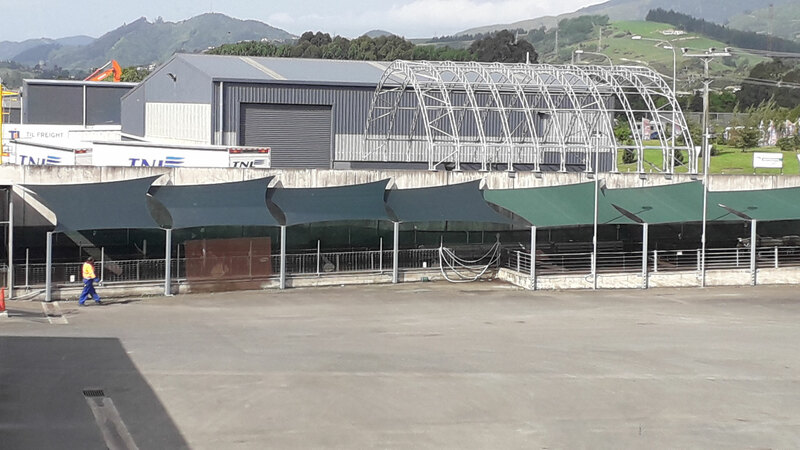 The fabrics we recommend have a manufacturers limited warranty for 10 years against deterioration in the fabric structure. 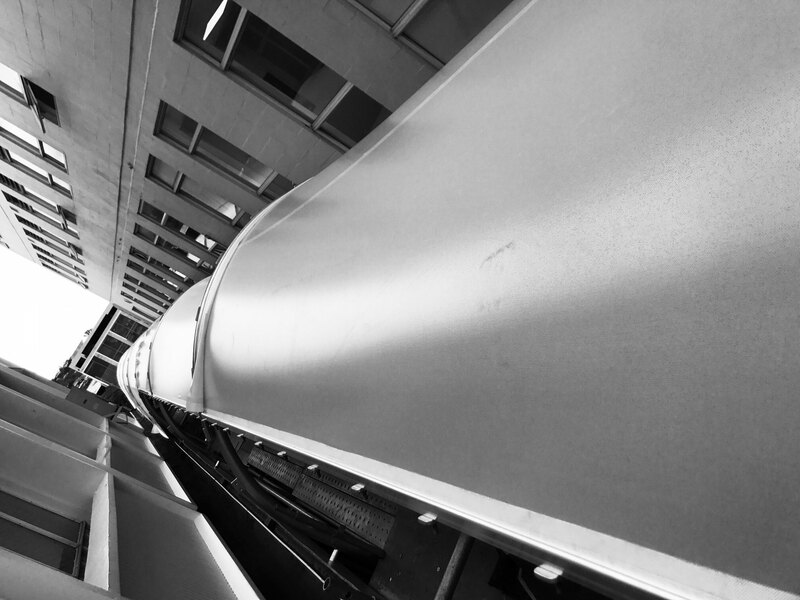 Some of the brands we carry are fire resistant. 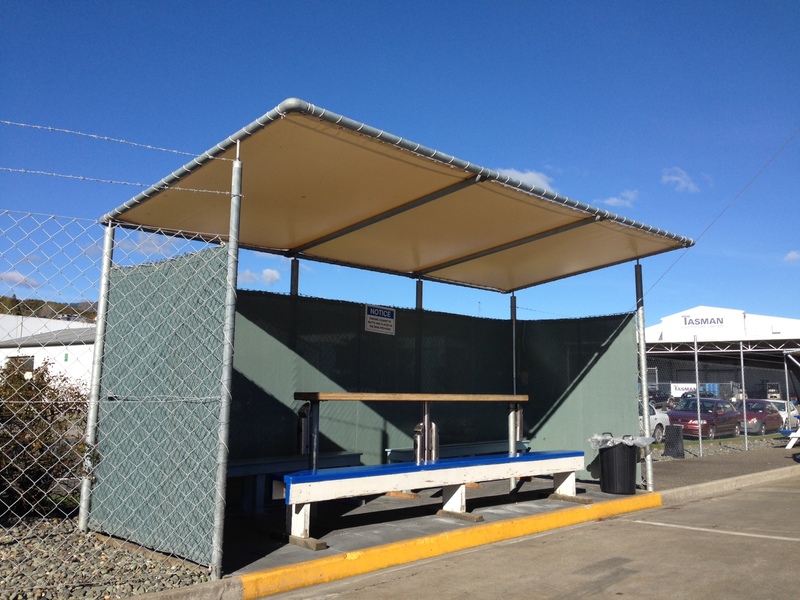 If this is required by you, please ensure you inform us so we can point you towards those fabrics. 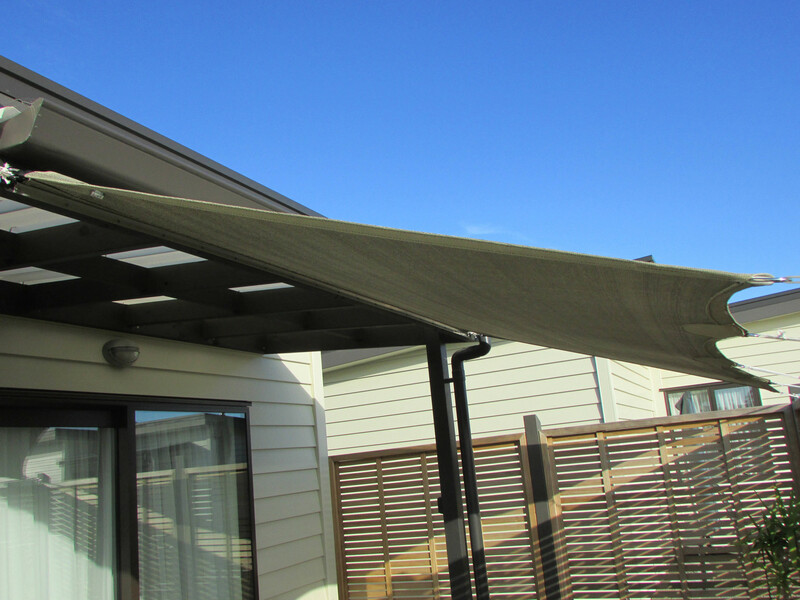 Waterproof shade cloth is shade cloth which has a waterproof coating on the underside. 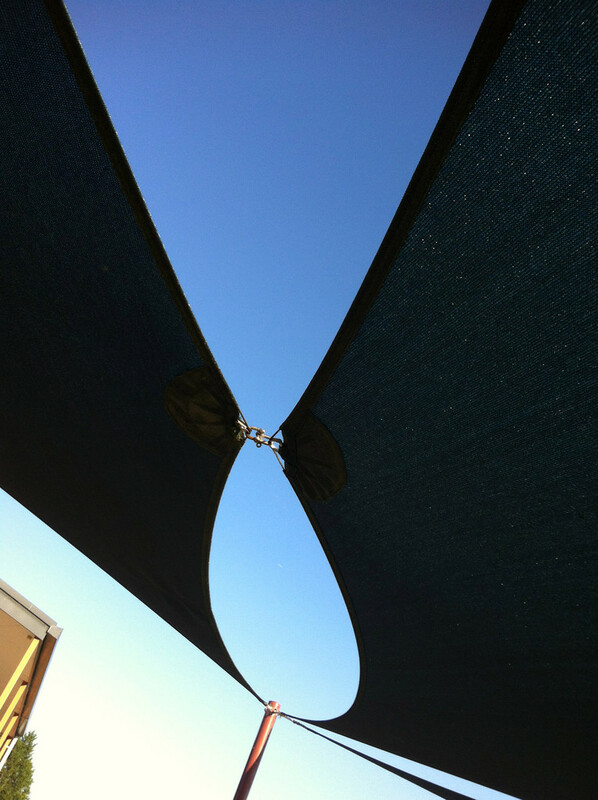 It looks from the top exactly like a traditional shade sail fabric. 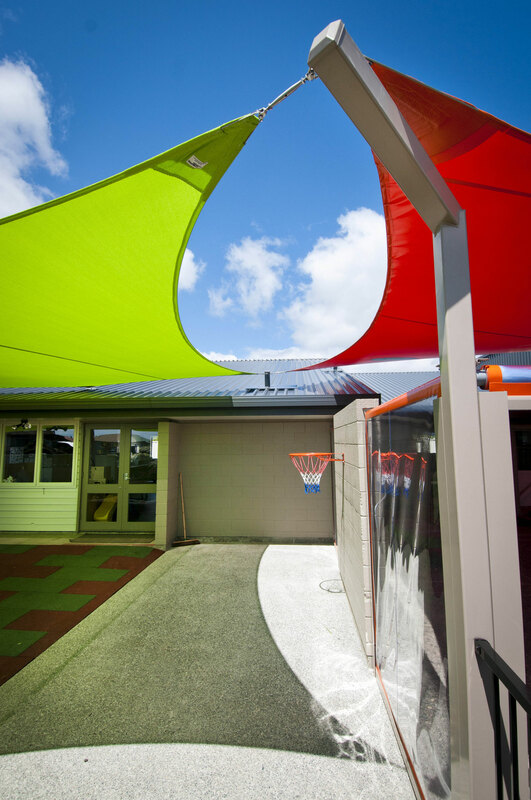 Architectural PVC fabric is waterproof. 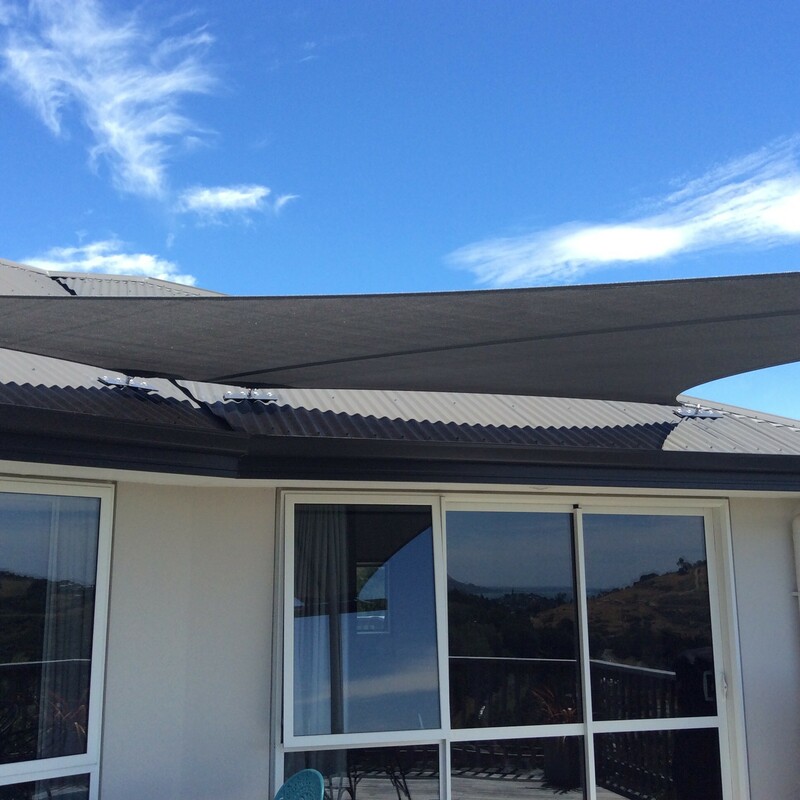 It a heavier weight fabric and therefore needs a more robust support system to attach to. 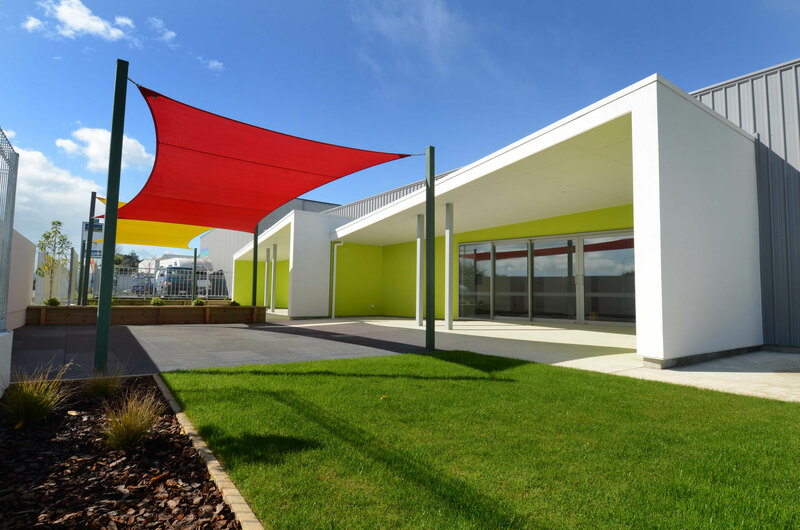 Architectural fabrics have a limited warranty of between three and five years although in reality, a much greater life is achieved given normal wear and tear. 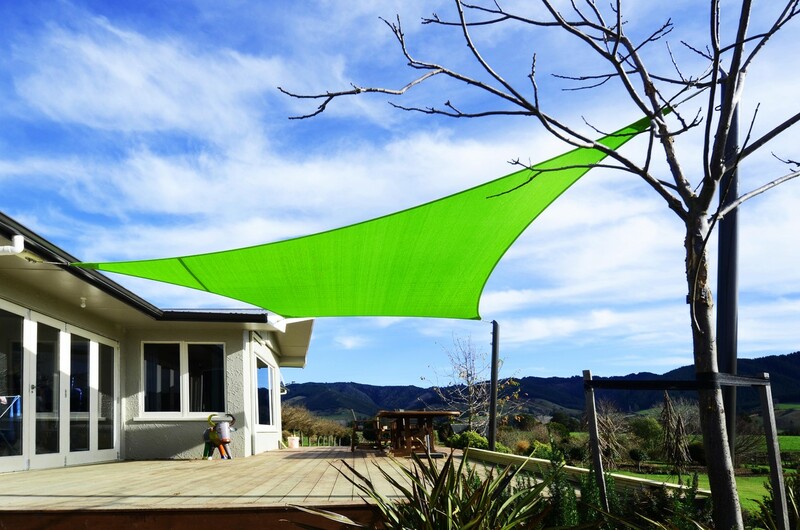 Most of these fabrics are fire resistant - please advise us if this is required. 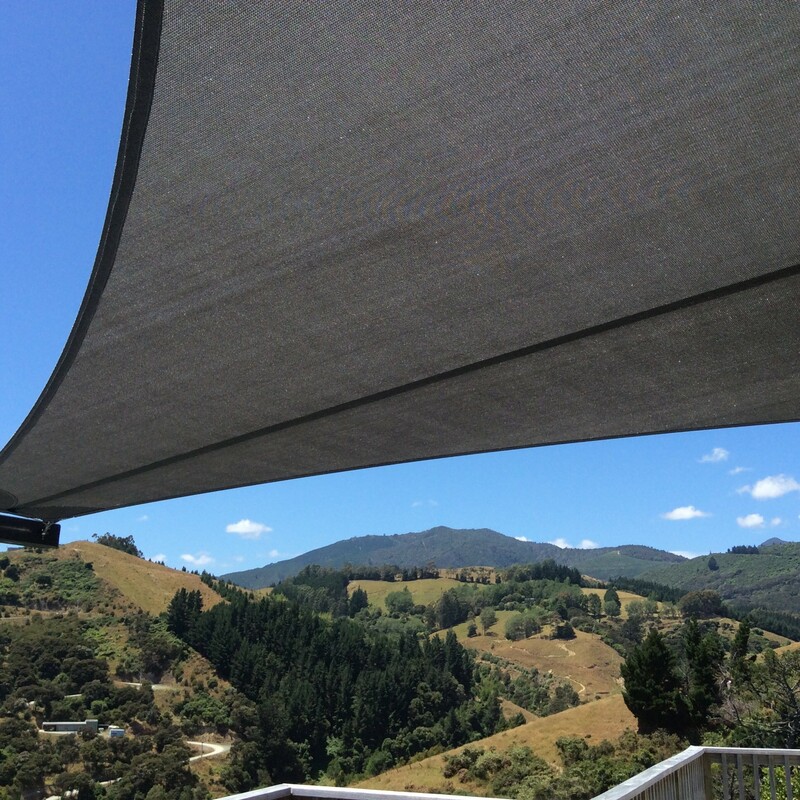 Outdoor PVC Mesh is the same fabric we use for our outdoor blinds and is used for shade in a non-tensioned structure. 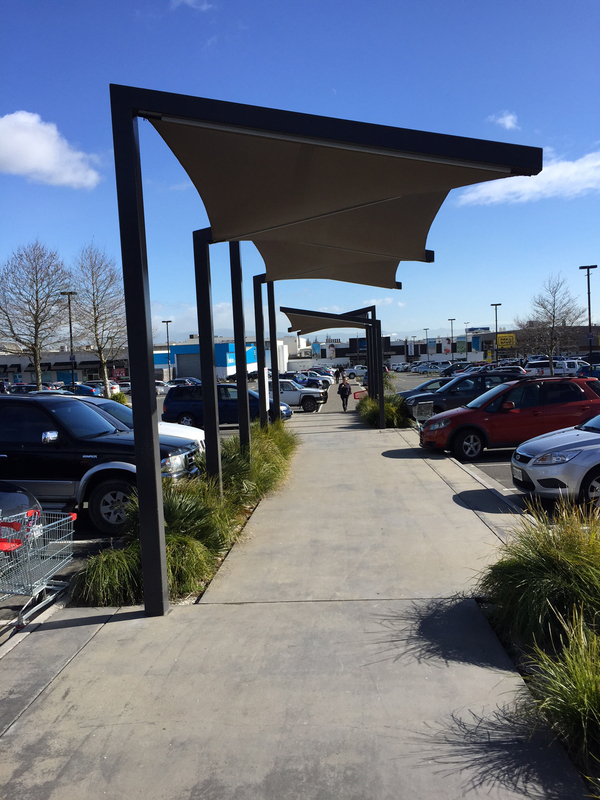 This tends to be found in roll-out horizontal blinds which are rolled back in when not in use or on structures not requiring highly tensioned shade sails. 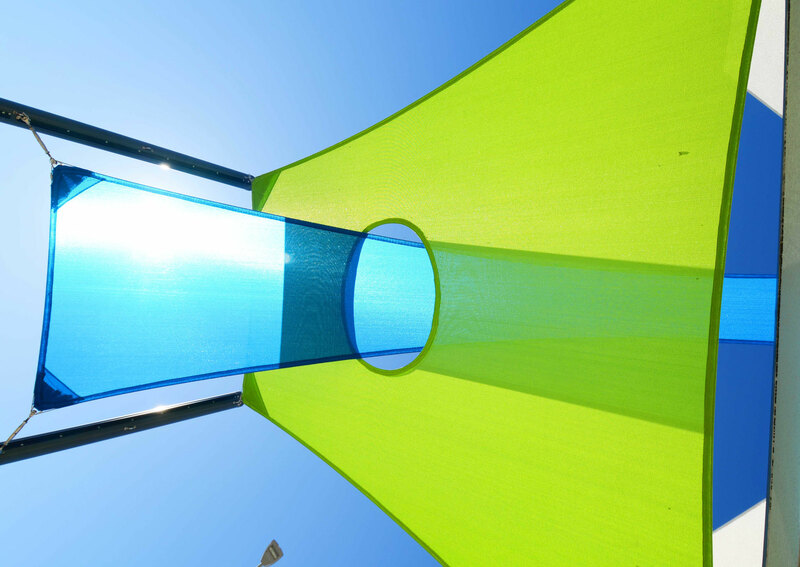 Outdoor mesh has a limited warranty of between five and ten years depending on the fabric chosen. 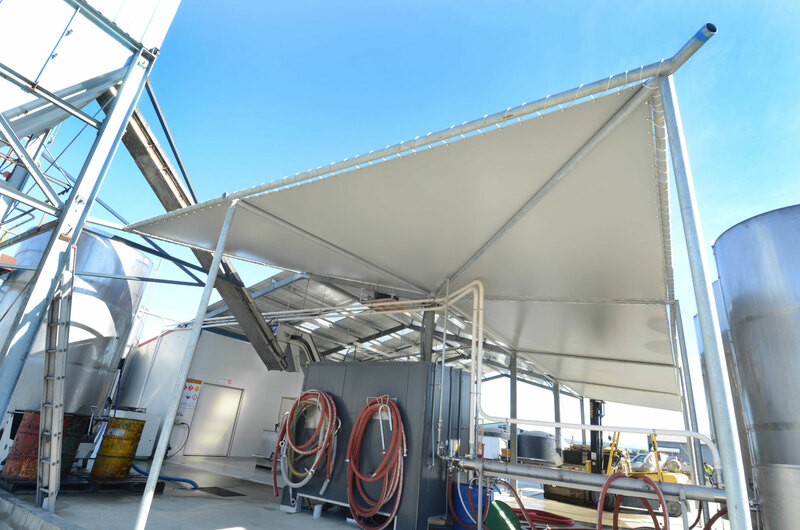 UV blockout is up to 90%. 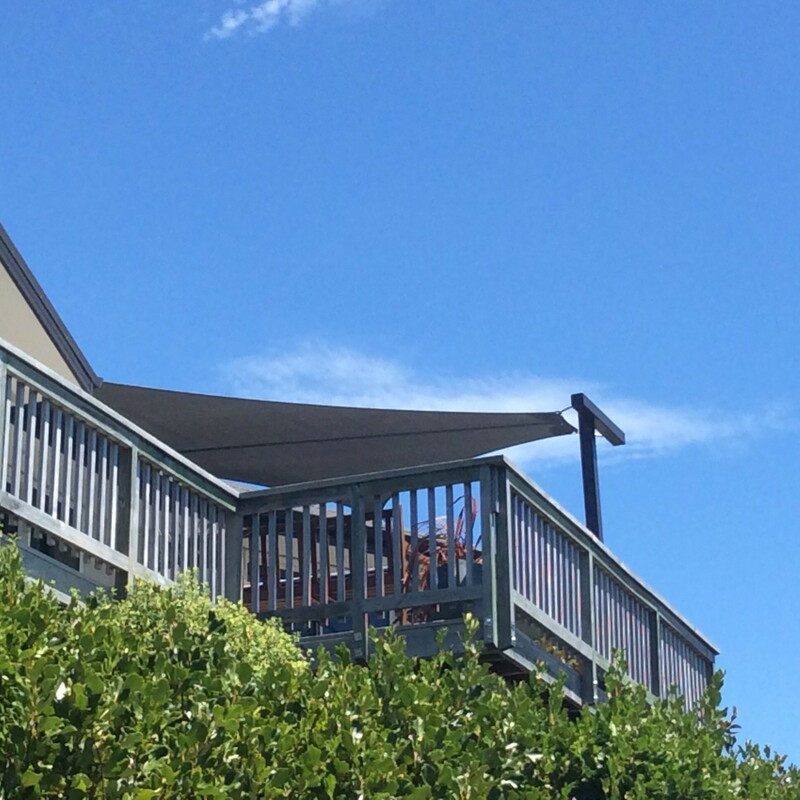 Most of these fabrics are Fire Resistant - please advise us if this is required. 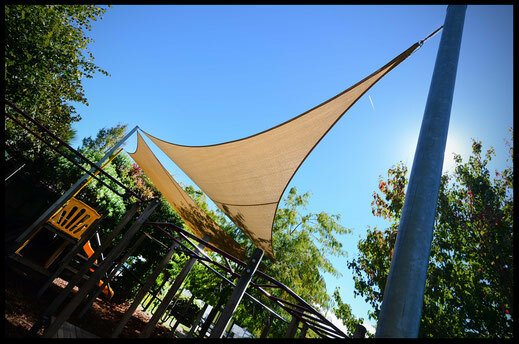 We use a UV resistant thread and all hardware associated with the tensioned sails and supplied by us is in stainless steel. 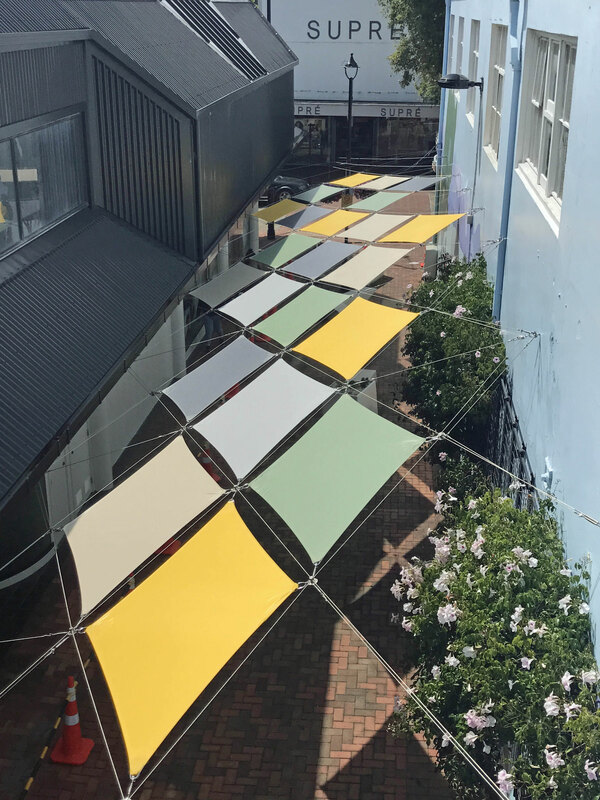 We stock Comshade, Rainbow Z16, Shadetec and Extrablock shade cloth fabrics. 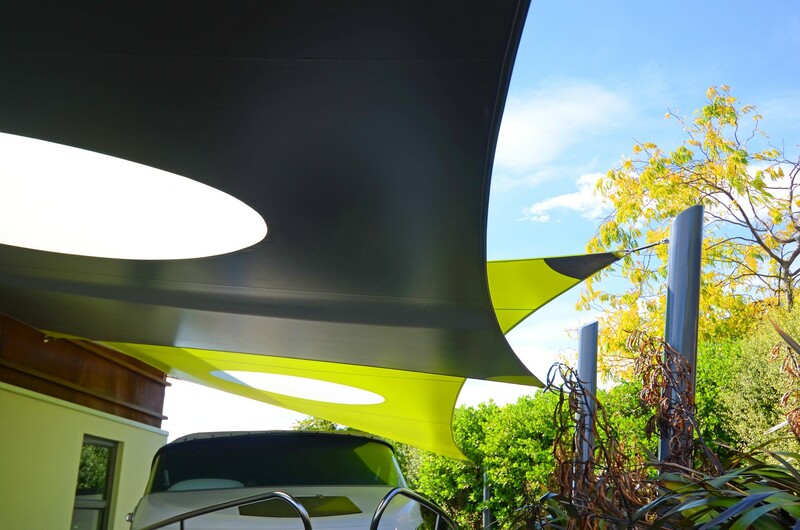 In architectural PVC we stock Serge Ferrari, Polystar F/R, AP1000, Diamond 700 and Mehler. 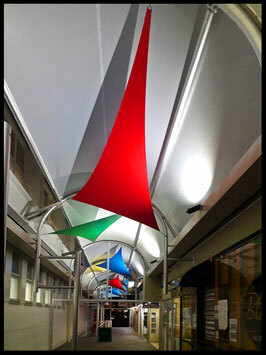 In PVC mesh we stock Atmosphere, Shadeview, Dickson Suntex (Phifer), Serge Ferrari and PVC-free Twilight. 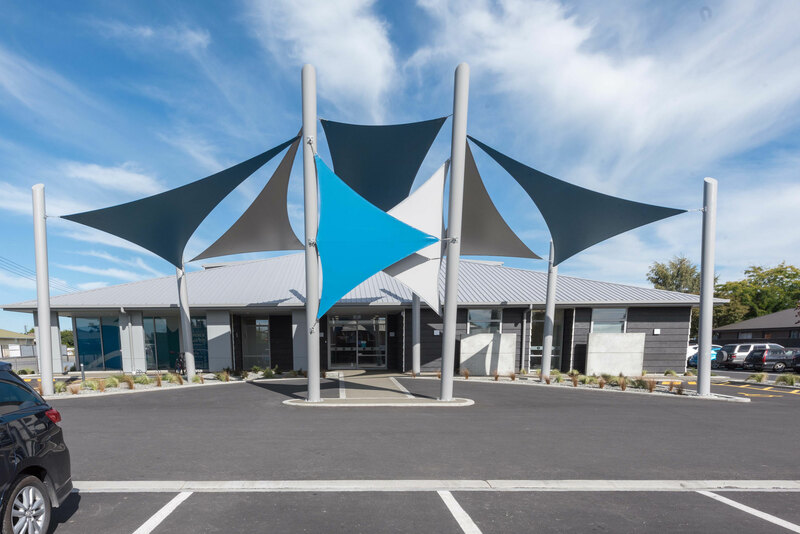 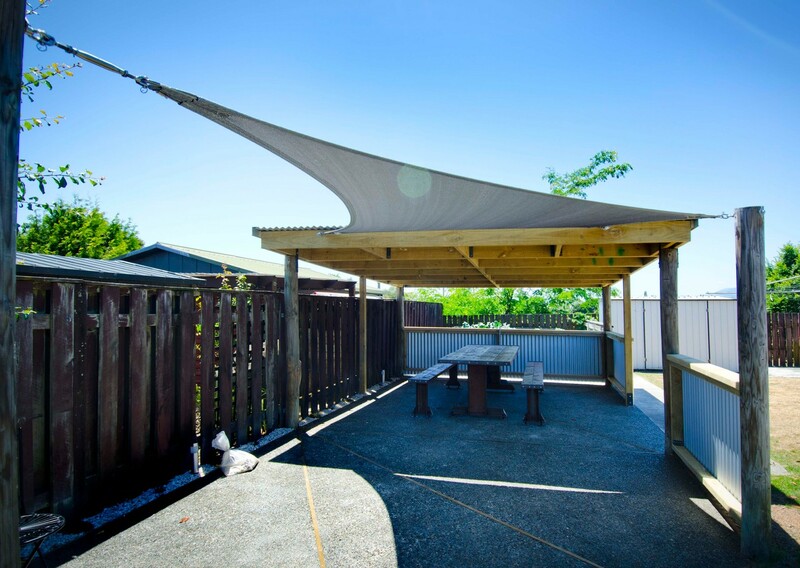 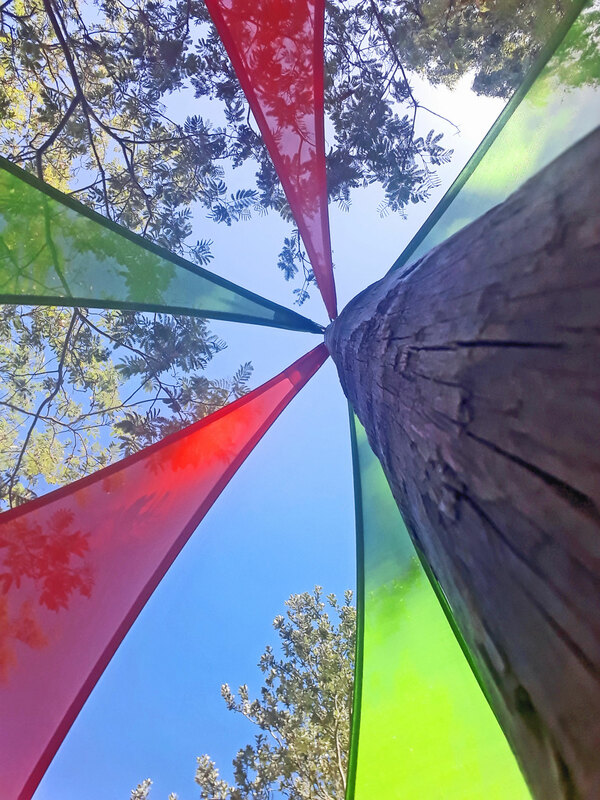 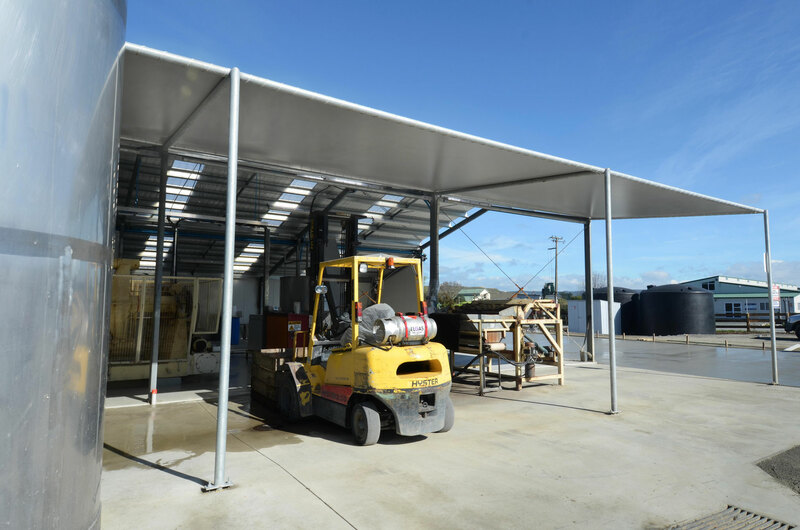 All our shade sails are made in Nelson in our purpose-built factory. 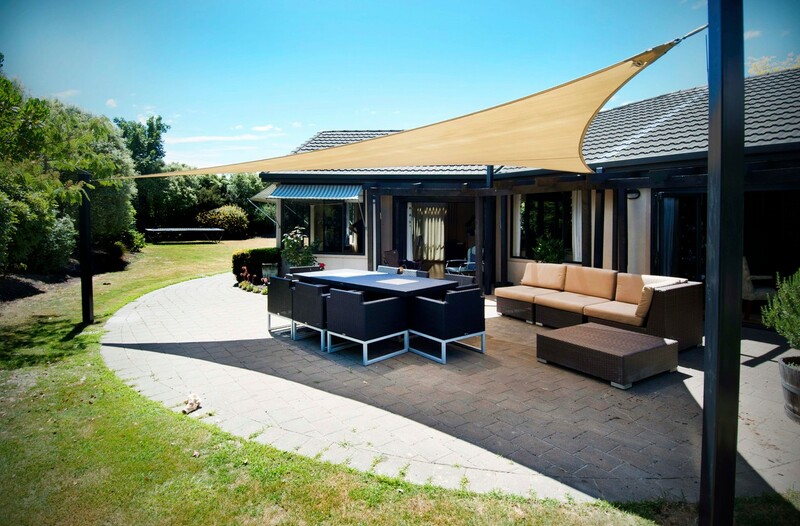 All steps, from design through to installation are controlled by us ensuring you get exactly what you want. 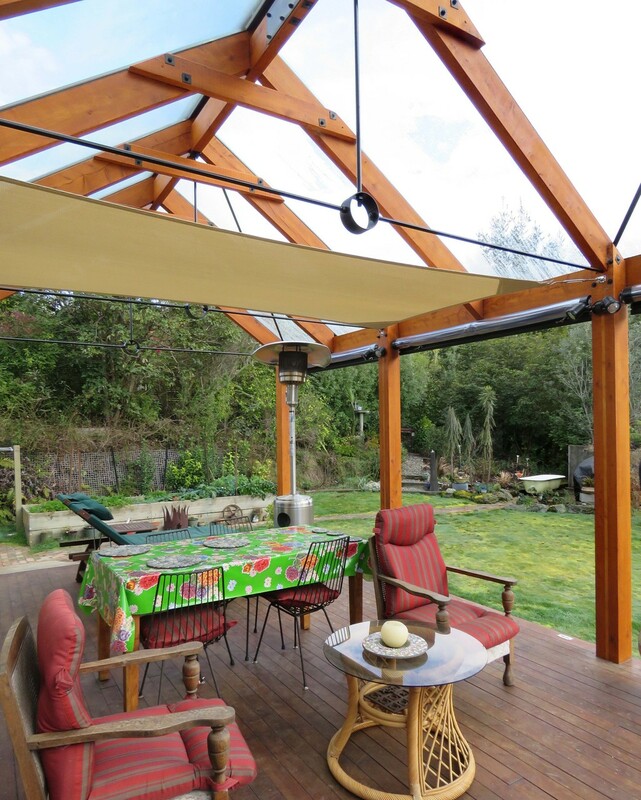 No project is too big or too small for our designs, most of which are based on suspended tension systems. 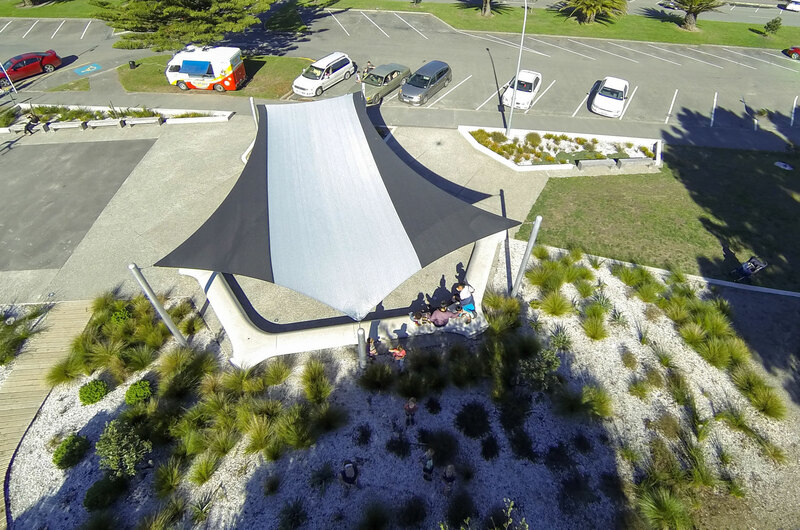 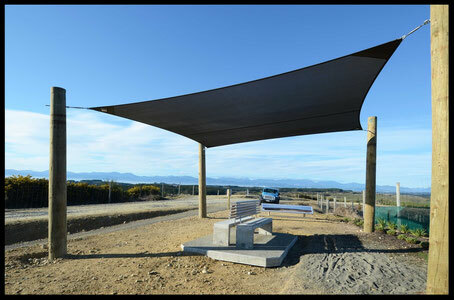 We donated a shade sail to the Nelson Cycle Trail - Enjoy the Shade! 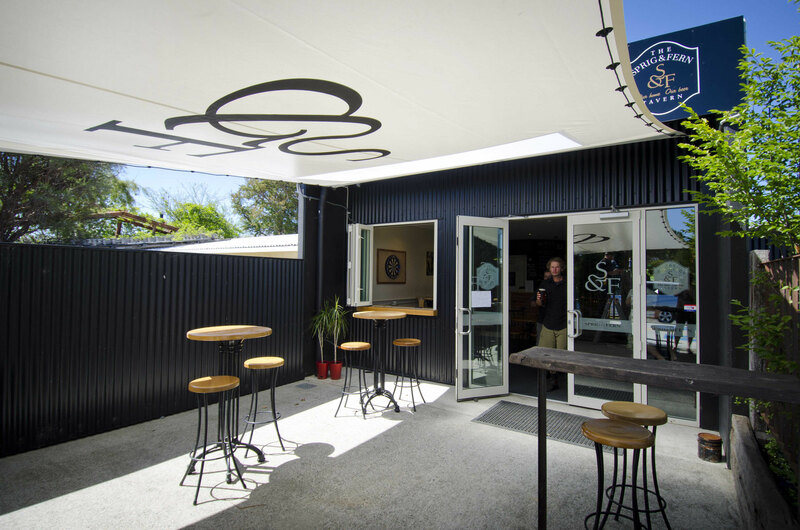 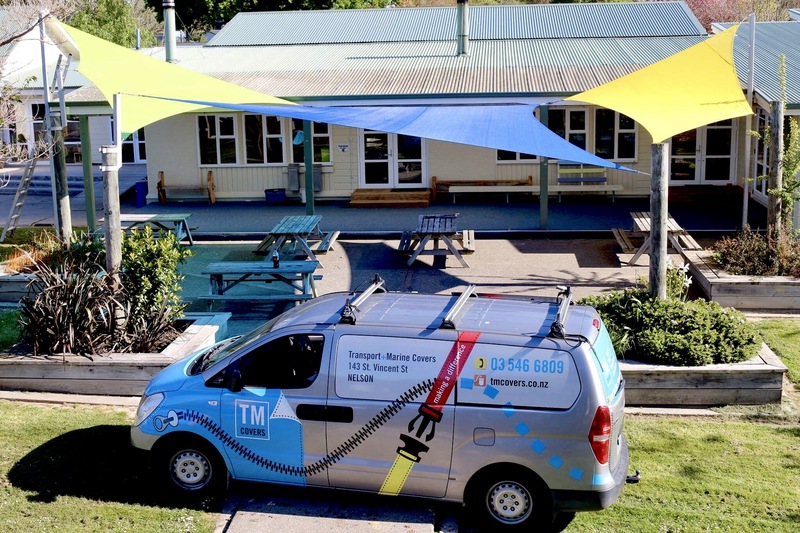 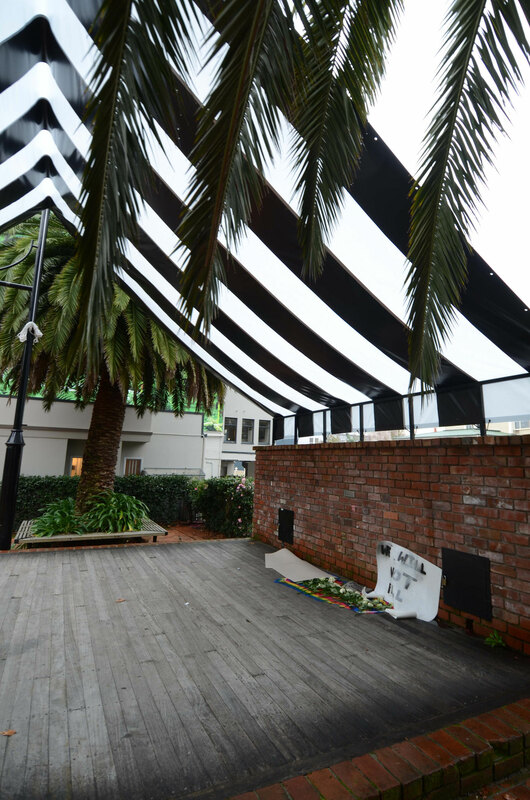 "Thank you and Transport and Marine Covers Ltd for providing this tremendous asset at the top viewing point of Tasman’s Great Taste Trail on Tasman View Road. 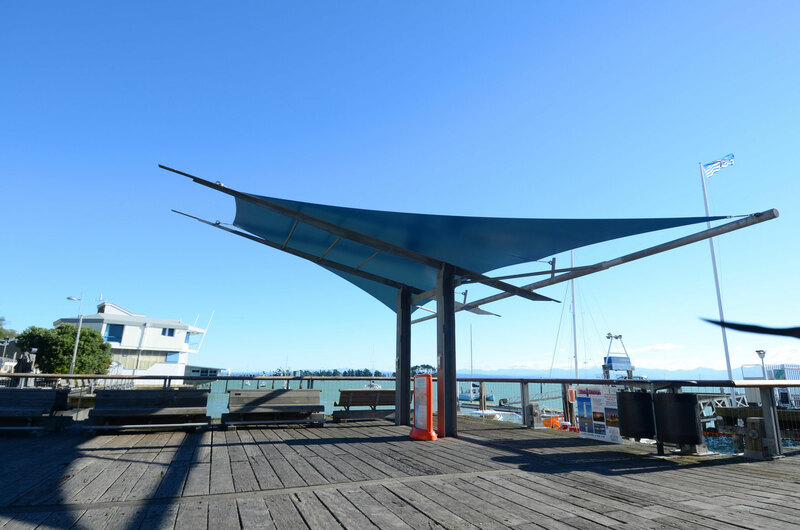 The area and shade will be appreciated by the many people riding this route, especially during the next summer months when we expect a considerable growth in use with this Mapua to Motueka now complete." 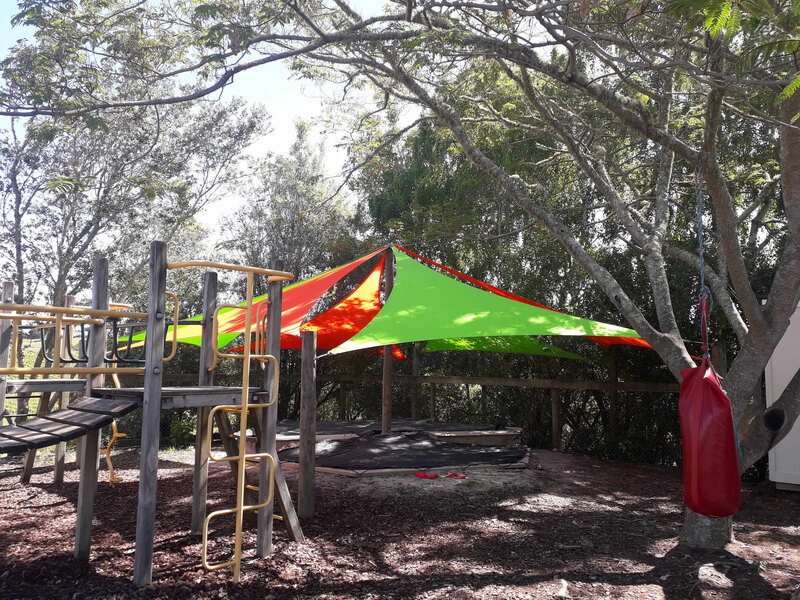 Please note: colours may appear differently on your computer screen from the actual fabric.